Start your day at Camille's, feel like a local" - Condé Nast Traveler Magazine, February 2002 "Voted Best Breakfast in the United States " - AOL Our Key West restaurant, Camille's Restaurant is not only the favorite local's restaurant, it is also a favorite for Key West 's visitors. 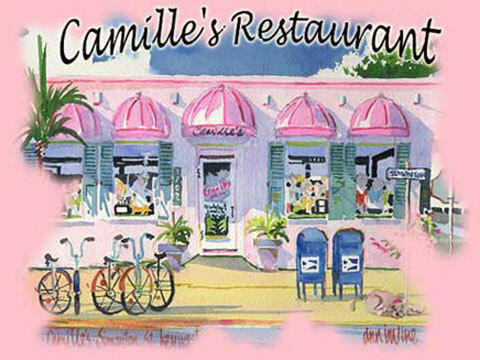 To really experience Key West you HAVE to experience Camille's! It's a funky restaurant that has been around for over 20 years. We are now at the corner of Simonton and Catherine. We've got some new faces and some specials but more space for more great times. We can host your Key West Wedding party, host your banquet meeting, and will accommodate your dinner party. A combination of a Soho Cafe and "a place where everyone knows your name." The local's here love the place-always a good sign- so call us for a reservation to guarantee you get a spot. And we never disappoint. It's inexpensive gourmet....done the RIGHT way. And we're children friendly, NEW coloring books, crayons; everything to occupy the younger jet-set. We're easy to find-you can't miss the flamingo pink awning! Find out why everyone is talking about Camille's Restaurnaunt and why it's voted Best Breakfast, lunch and dinner in Key West by locals, visitors, national magazines and much more!